We’d be interested in seeing you play live before we book – is this possible? Yes – keep an eye on my Facebook page or check out the gigs page for live dates. It’s worth contacting me to confirm though though as these dates are not always set in stone. NB – my apologies that live dates are few and far between in the Summer. I’m generally booked for weddings/private events most weekends. For venues further afield, it may not be practical for me to travel there and back on the same day, in which case I’ll seek overnight accommodation and factor this cost in also. My wedding is abroad – would you travel for a destination wedding? Contact me with your dates, and if I’m able to travel out and back without affecting any of my current bookings, I’d be delighted to head abroad! I would of course have to factor in flights, accommodation, transport of my musical equipment and extra time, so would need to prepare a bespoke quote. Firstly contact me to check I’m available for your date. The next step is to fill in a short booking form, and arrange the deposit payment of £100. This can be paid via BACS, cheque, PayPal and credit/debit card (a 4% fee applies for PayPal and cards). Once I have your booking form and deposit, the booking is confirmed. I will then send you a full contract and further information about the next steps. By filling in the booking form and paying the deposit, you agree in principal to the terms & conditions. These are the same as listed on your contract. If for any reason, when you receive the contract, you change your mind and decide you don’t want to go ahead, let me know and I will return your deposit to you. When do you need the remaining balance paid? No later than a month before the wedding. Yes of course – just let me know as and when you make a payment and I’ll email you to confirm that it’s been received. The easiest method without fees is direct BACS bank transfer – I’ll let you know my details when you book. Cheques are fine, and you can also pay with PayPal or using a credit/debit card using the button and instructions below – Please note, there is a 4% charge for PayPal or card payments. Click the ‘Pay Now’ button below to be redirected to the payment page. Under “Item Price” enter the amount you are paying – including the 4% surcharge. If you are unsure of the amount contact or email me. Click ‘Update’ and then fill in your PayPal or card details on the right-hand side of the screen. Can we meet up with you prior to the big day? Yes definitely – I always prefer to have a meeting where possible so that we can discuss arrangements. Just drop me a line and we’ll try to organise a place and time. If we live far apart, I’m always happy to do a Skype or FaceTime meeting if that’s more convenient! And if we don’t manage to meet up, I’m always contactable by phone or email. Do you play with amplification or acoustically? 99% of the time I will need some amplification. At some ceremonies where the chosen venue has favourable acoustics (eg. churches), I may be able to play unplugged. However, even in these kinds of venues I usually prefer to use an amplified setup – this allows me to raise up the speaker, giving better projection and means that people at the back should be able to hear the music clearly. I have a couple of setups – at wedding ceremonies, drinks receptions and small evening events I use a compact Bose PA system (pictured below). I have a larger PA system which I use for occasions which require more volume. If you have any concerns about the volume on the day of the wedding – please let me know beforehand, or during the performance if necessary! When I’m playing, it can sometimes be tricky to know whether it’s too loud or too quiet – so by all means let me know if you think it needs a tweak! Will you need a power point? Yes. If the performance is outside, I will need access to an outdoor power socket or be able to run an extension lead. I would generally not run an extension lead longer than 20m due to safety reasons. If you think this may be an issue, please contact your venue in the first instance for their recommendation. My venue won’t allow amplification – can you play acoustically? I can, but I don’t recommend it. The performance will be much quieter – so you may find that only people within earshot will be able to hear the music. Particularly in outdoor situations, the sound gets “lost” quite easily due to the open space, and once people are talking to one another you may find that the guitar and singing is not easily heard. In this situation I would usually roam around and try to cover as much area as I can. Your venue contacts will be experienced in knowing whether guitarists have worked in the past, so they should be able to advise you better than I can! Also be aware that if I’m playing unplugged, I won’t be able to use my loop pedal – so the songs may sound a little different to how you may have heard them on my YouTube demos. My venue insists that all performers have Public Liability Insurance/PAT testing certificates – can you supply these? Yes – more and more venues are listing PLI as a requirement now. 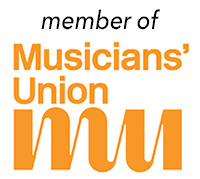 As a member of the Musicians Union, I have full liability cover and equipment insurance. Electrical equipment is PAT tested yearly. If they need to see proof of my documents just put me in touch and I will send over a scanned copy to the venue. My venue has a sound limiter – is this a problem? No – as a solo acoustic musician my volume levels aren’t very high and should never get anywhere near triggering a sound limiter! More information here. Requests must be sent to me at least a month before the wedding – depending on my workload, I may struggle to learn them in time otherwise. The rest of the songs can be chosen from my extensive repertoire, which is added to most weeks! How many songs should we choose? The repertoire is online here, and the song choices page is here. I’ve seen you using a loop pedal on YouTube, will you use this when playing live? I want a specific song as I walk down the aisle (or during the first dance) but I’m unsure as to how it will sound played on guitar? I can send you an mp3 recording of the song – just let me know in plenty of time! The song I’ve picked to walk down the aisle to is 4 minutes long… but it will take less than a minute for me to walk to the front! How does this work? I’ll adapt the song, and end it at an appropriate point – so that we’re not all stood around waiting for me to finish playing! What will you wear on the day? For wedding ceremonies and drinks receptions, I will usually wear shirt & tie + waistcoat with smart trousers and shoes – unless you request otherwise. If there is a colour theme, let me know on the booking form and I’ll try to fit in with this. For evening events I will usually wear smart dark jeans with a shirt & waistcoat, or a smart/casual shirt. If you would like me to come slightly more formal or more relaxed just let me know. Also if you have a theme you’d like me to fit in with, let me know and I’ll see what I can do. We’d like to book you to play just one song, is this possible? It is… however, I have a minimum charge of £275. Much as I would love to play one song for a cheap rate, this unfortunately would prevent me from taking on a full wedding booking – and in the busy Summer season I’m usually booked out every weekend! If the minimum charge is too much, you could always try contacting me a week or two before your wedding to see whether I’m available, in which case I would be happy to do it more cheaply. If booked for the full day, I’d usually say yes – but it’s certainly not a requirement. I’m pretty low maintenance! I never insist on being fed, but if the offer is there I certainly won’t say no either. Have you been to our venue before? Where have you played? 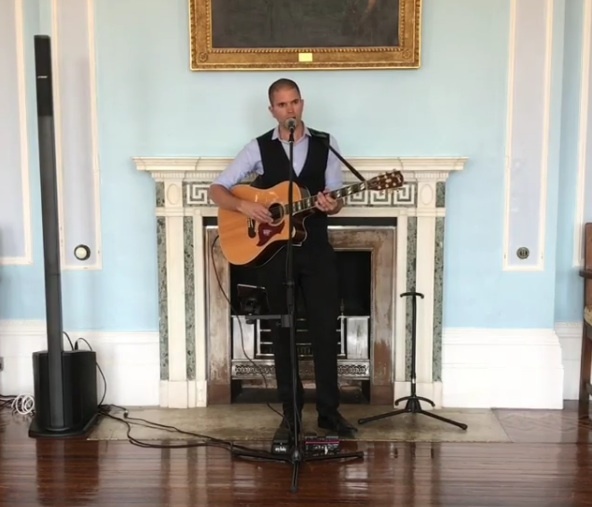 That’s a long question to answer 🙂 Here’s a list of venues I’ve played at in my time as a wedding guitarist… I’ve added web links for those still searching for some wedding venue inspiration!